The data is in! We have completed our first year of Dr. Bob’s SoundSchool, including analysis of the program’s effectiveness. 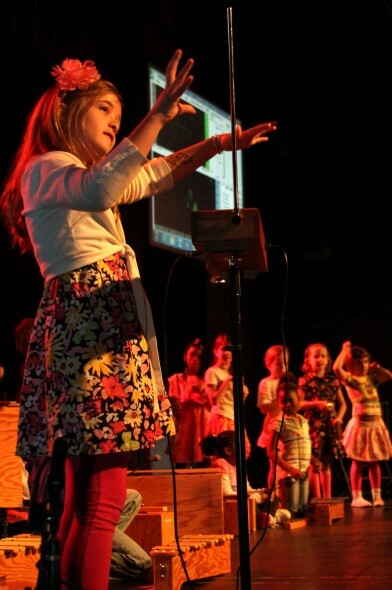 The entire process of curriculum development through data analysis has been incredibly rewarding, with an amazing team working together to realize the goal of the Bob Moog Foundation: to educate and inspire children through the power and possibilities of electronic music and the intersection of music, science and innovation. 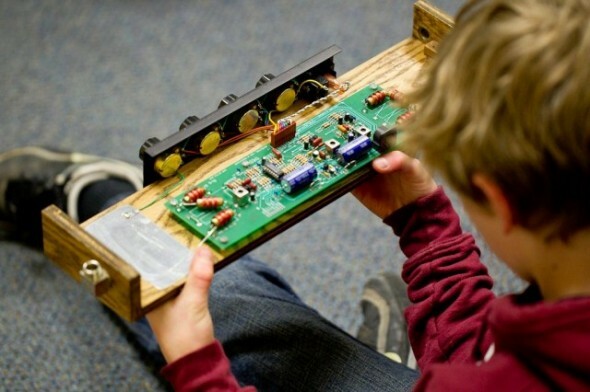 Dr. Bob’s SoundSchool was reconceptualized last summer through the combined efforts of Asheville City Schools and Bob Moog Foundation volunteers and staff. Teacher Training – We developed teacher training materials for four teacher training sessions so that teachers would be prepared to teach physics of sound using synthesis, and so that they would be able to act as mentors to new teachers joining the program in years to come. It was very important that we create a self-sustaining model for Dr. Bob’s SoundSchool so that it can grow far beyond Asheville. Student Lessons  We developed ten lessons for students that were designed to meet state and national standards for science education in the second grade. One of the themes in these lessons was the idea of a sound wave as a wiggle, a concept meant to encourage creative and playful engagement with science. We wanted students to learn about these sound wave wiggles by creating chains of sound with cards, by acting like air molecules in sound waves, by viewing sound waves on oscilloscopes, and of course by playing the theremin. In the fall, we shared the curriculum with eight second grade teachers in the Asheville City Schools. We met monthly to do trainings meant specifically for the teachers, as well as overviews of the student lessons. The teacher training focused on preparing teachers to teaching the student curriculum, and also to be mentors to future teachers who will use the curriculum. Teachers tell us that after the kick-off students couldnt wait to start learning about sound. The ten lessons in the curriculum were taught in weekly sessions between January-March. They began their lessons with a discussion of the use of scientific notebooks, using one of Bobs own notebook pages as an example. From there, they gradually built their knowledge of sound through lessons that focused on different aspects of the wiggle, a term used interchangeably with soundwave. The lessons are highly interactive, allowing students the opportunity to be junior Bobs, investigating the properties of sound through experience. We gathered pre- and post-tests from these students, as well as from students learning the science of sound with the district’s standard curriculum. We created pre- and post-tests to evaluate student learning with the Dr. Bobs SoundSchool curriculum. The tests comprised questions that addressed the learning objectives in the North Carolina Extended Essential Standards, which also meet national standards for science learning. The questions were designed to assess convergent and divergent thinking skills. Convergent thinking is the ability to identify the correct solution, as exemplified in multiple choice or fill-in-the-blank questions. For example, students were asked to identify the parts of an ear from a diagram. Divergent thinking is the ability to express knowledge through examples, where there is not necessarily one correct solution, as exemplified in story writing. For example, students were asked to write a story about being the sound of a roar coming from a tiger. The pre- and post-tests were given to the eight classrooms that learned from the Dr. Bobs Sound School (DBSS) curriculum and to three classrooms that learned from the standard curriculum used in the Asheville City Schools. 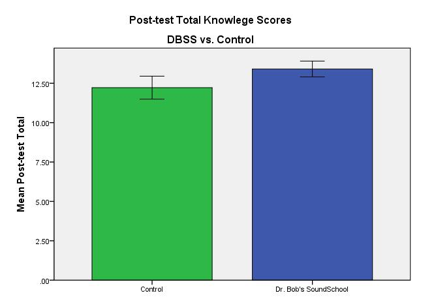 Overall, students using the DBSS curriculum showed more knowledge gained on the post-test, as shown in Figure 1. On the convergent thinking skill questions, where students had to identify the one correct answer, there was no difference between the two curricula, as seen in Figure 2, and for some individual questions students using the standard curriculum scored higher. 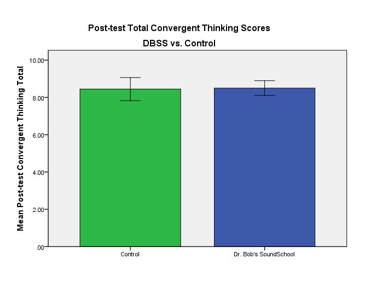 On the divergent thinking skill questions, where students had to express knowledge through stories and drawings, the DBSS students had significantly higher scores, as shown in Figure 3. 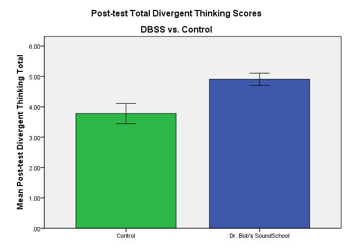 These results suggest that while both curricula increase knowledge about sound and soundwaves, the DBSS curriculum better supports making active and interactive use of that knowledge. Students who learned through Dr. Bobs Sound School were prepared to apply their knowledge to novel situations. This fall, Dr. Bobs SoundSchool will continue in the Asheville City Schools, and will include all second grade classrooms. Additionally, we will include ten teachers from four elementary schools in Buncombe County School District in North Carolina. All teachers will participate in four teacher training sessions this fall, and then will teach DBSS to their students in the spring. This meets our goal of building our program first in North Carolina and then across the country. The DBSS curriculum has already been revised to address teacher feedback and what weve learned from the student evaluations. We are also adding optional lessons for the iPad that will allow students to interact with sound and soundwaves through touchscreen applications. Our main goals for this year are to continue refining Dr. Bobs SoundSchool and to continue developing our infrastructure to support greater expansion in the coming years. It has been such an exciting and rewarding year working on Dr. Bobs SoundSchool with so many talented sound experts, musicians, educators, and students. Everyone is dedicated to bringing students the best possible experience of the science of sound, inspired by Bob Moogs legacy. I couldnt be more delighted with the progress weve made this year in the development of The Bob Moog Foundations education initiatives. We are a strong team with a solid plan for educating and inspiring students for years to come. A clear, readable report, with encouraging conclusions–very heartening to read, documenting a fine accomplishment for the BMF. Congratulations!